Bronx has a home! 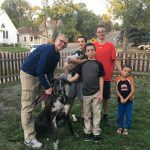 - Rocky Mountain Great Dane Rescue, Inc.
Bronx has a home with his new family in Rifle, CO. Natalie, her spouse and and their 4 sons are elated to see the joys that a Great Dane brings to ones heart and home. Bronx will have to fur friends to share his new home with…a rat terrier and a cat! Fortunately due to to work schedules this lucky boy will rarely ever be home alone. Natalie is looking forward to having Bronx go on her runs with her each day. Way to go sweet boy!